Artist, composer and producer Beto Hales has a recently built private studio Located in the San Fernando Valley in California. In this article, we take a look at some of the equipment that Beto selected and he shares his thoughts on what and why he chose them. Born in Mexico City, Beto moved to the USA in 1992 to attend Berklee College of Music and later received a Masters in Music from University of Denver. His new studio, Los Olivos, gives him a permanent base from which to record his new album, tentatively titled Orbs of Light, with co-producers Pablo Munguía, Brent Fischer, and Sal Ojeda. The first single, Closer To You, is already available worldwide on iTunes and other download services. Los Olivos has been designed by studio designer Jay Kaufmann and wired by Nicole Tafralian, of Nikitek, Inc. Los Olivos is a 2,000-square foot facility featuring a live room with 20ft ceilings, two isolation rooms and a control room equipped with a Pro Tools HDX system and an Avid S6 console. The studio features a full complement of outboard gear and an extensive microphone collection featuring a vintage Neumann U-47. 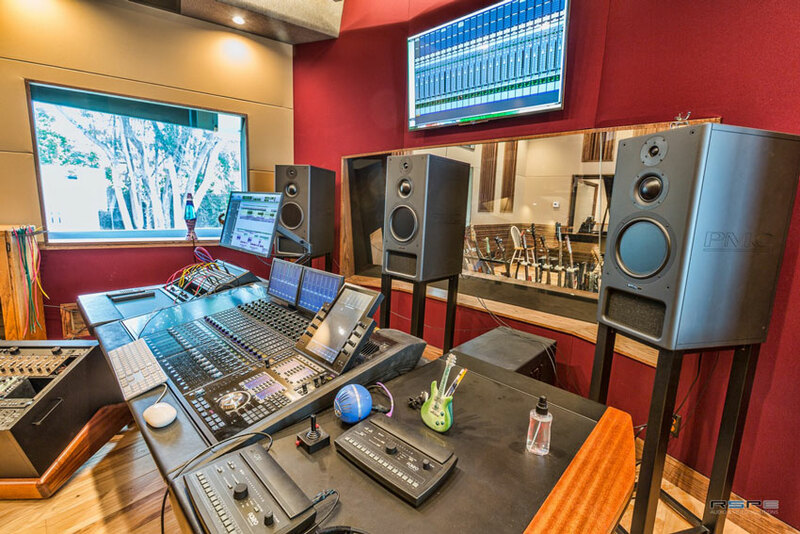 Beto: My studio is private, but is available to a special cadre of exclusive clients involved in the music, film, TV and gaming businesses that come directly recommended by industry pros. It is fully integrated for video, facilitating scoring, as well as voice over and ADR recording. The goal of the design was to make it a creative haven; it is surrounded by gorgeous foliage that you can actually see; there are windows to the outside (quite a rarity!) and lots of natural light pouring in. Beto: As the Los Olivos Studio came together, I knew that it was time to evaluate speakers. I immediately called Ron Cheney of RSPE Audio Solutions to coordinate a demo of the top brands of studio monitors in their demo suite. It really opened my eyes and I was blown away. The PMCs translated every type of music across the spectrum with incredible clarity, transparency, and punch. I was convinced right then and there. As a result of that demo, Beto decided to invest in a PMC 5.1 monitoring system comprising of three IBIS-AIII reference monitors, a pair of twotwo8 monitors and a twotwo sub2 active subwoofer. Beto: My PMCs are so faithful that they force me to be an extreme perfectionist in my work, which I already thought I was! They are so clear and so precise that they have actually helped me to improve the quality of my recordings. They are a pleasure to listen to. Moving onto the Avid S6, which might seem a strange choice for an artist's private studio, Beto decided to install and M40-6-5 Avid Pro Tools S6 control surface. So why did Beto choose the Avid S6 Control Surface and what benefits did it provide? Beto: I wanted to get away from using the mouse all the time! I missed having real faders and console controls to mix and record with. For me the benefits are many. Direct control of most Pro Tools functions, being able to record and mix with an interface that feels like a real board... Too many to list here! Beto: I was blown away by its beautiful and ergonomic design; it's a striking piece of gear! I had been mixing on a laptop for a long time, so this is a big jump; it takes me back to when I worked with large analog boards; everything is at your fingertips, and you get that physical connection to the session that you simply cannot experience through a mouse and a keyboard. I had used earlier versions of interfaces for Pro Tools and they all pale in comparison, in my opinion. Beto: I would have to say all of the above. I think Avid really hit it out of the park! All control are within easy reach; you can configure them to your specifications, and you can organise the modules in different ways to your liking. The visual feedback it provides is outstanding, from the detailed editing of effects plug-ins to level metering and audio-clip trimming and fades. The visual colour feedback is wonderful; it really helps to quickly identify functions on the fly. The connectivity via EUCON is flawless, In short, I love my S6! Beto: I haven't had a single issue with my S6 since RSPE delivered it. The guys at RSPE have been there for all my equipment needs. I get first-rate service, great pricing and have developed great friendships there as well. I especially want to thank Ron Cheney who helped me with all the new gear I needed for the studio and continues to be there when I need anything. As we often say here at Pro Tools Expert, developing a relationship with a reliable dealer can make all the difference in choosing equipment. As an individual, we cannot be across every development and new product release as well as how they perform in real situations. Dealers and consultants can help you not to make mistakes when choosing equipment and also help you try things out, either in their demo room or sometimes in the comfort of your own studio.